Microsoft Dynamics NAV is a full business solution Suite, Navision is an ERP solution for small to medium size organizations. 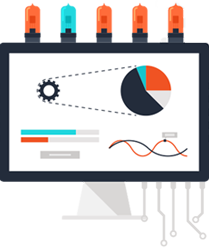 The developers and consultants in Navisionindia.in Dynamics NAV team are highly skilled with years of experience in supporting various clients and meeting their diverse demands. We work on the base of concept of requirement gathering process. Firstly we make full understanding of Clients First Business Solutions, Whole Operations and Process of client Business, Technology and how it applies to your business. The best ERP and business management software like Microsoft Dynamics Navision (NAV) must be implemented and supported by team players with the tools and training to effectively apply them. We feel we should gather more information from our clients to deliver the best accounting, distribution and manufacturing solutions to manage their business costs effectively. Our team has been working on NAV platform since long and team has created efficient, scalable and elegant application solutions for various businesses.